A Chinese Seafood restaurant that could satisfy your crave of sea foods. 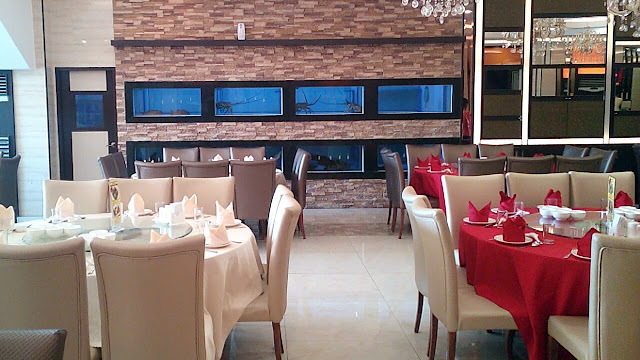 Fortune Hong Kong Seafood Restaurant is a Chinese styled restaurant which offer different kinds of Chinese menu that will surely fulfill your wishes. In this article, the Best of World Travel team will show the readers about all of our experience in their restaurant in Subic Bay. 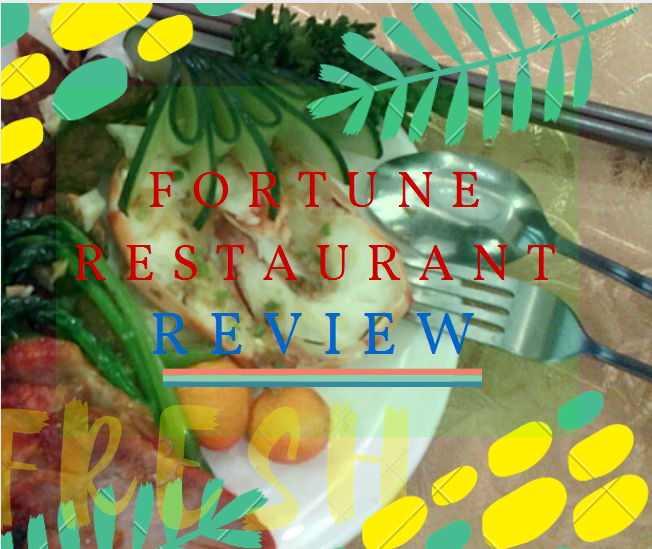 Fortune Seafood Subic can be enjoyed at Dewey Avenue CBD Area Subic Bay Freeport Zone. They have a spacious parking lot and a cooling effect fountain just in front of the industrial park (they are located beside the hotel). Upon entering, there goes a very respected guard that helped us up as we tried to hold the handle of their clear door. When we entered the restaurant, the dining hall sparkles! ~ ~ it was an awesome sight! Red and white table cloth bombards the customers with a couple of glistening chandeliers and mirrors . There were also some cool blue aquariums that showcase some huge lobsters that (maybe) can be chosen for dinner! Yeah, a very fresh from the aquarium type menu! The common diner was typically separated from the VIP dining hall, the latter can be enclosed into a group of rooms for private use. Since we were included into the “unplanned” VIP lunch, then we directly went straight ahead to the VIP room! What an experience! Even though we saw some good news inside the restaurant, there were also some kind of a downer in their dining hall. There were some construction people that renovates their hall near the staircase. Well, it should not bother some customers, but they were doing some “dusty” works that might pollute the air and or the food! It doesn’t matter for me, but what about the others? I think they should have at least enclosed the workers to prevent the dust from spreading or worked everything after closing. But still, our lunch wasn’t interrupted by that kind of timing. The restaurant Fortune Hong Kong Seafood Subic offers a wide variety of Chinese cuisine that specialize in the field of “sea foods”. First, we were served a refreshing set of juices! I ordered the “lemon juice”. I politely asked “Can you please serve it without ice”. It was full of ice. awww! What a bummer! Btw, the juice tasted OK, the sweetness and sourness combined was nearly perfect, but I think there was nothing special to what I had tasted. After a few minutes, there came the “green soup”, everyone was in awe since we did not knew what kind of food was that! Apparently it was a Spinach soup mixed with a lot of green vegetables (all hail vegetables!). I did not like the taste, but I think it was the healthiest food served during the course! Since it was healthy, I tried finishing my bowl…. after a few rounds of food. Just after sipping one tablespoon of the spinach soup, there goes another batch of soup! A corn soup! Among the two soups, I liked this soup more than the first. It tasted great and the temperature was just perfectly synchronized with the ‘corny’ taste of the soup! I could feel the soup flowing through my mouthy tube down until it reached my stomach. It gave a shivering effect to my hungered body. I could live the whole lunch just with that! The next thing was BIG, a somewhat”specialty”, “Fortune Combination Cold Cuts”. I am NOT really sure (even now) if it was one of the restaurant’s most exquisite food, I just assumed it because they added their name on it. haha. When I asked the dish’s name the waiter just told me “cold cuts”, and I was like, “what, CATS?? ?”… and everyone were in silence. I only knew it’s whole name after reading their menu sheet. As far as I am concern, their Fortune Combination Cold Cuts was full of meat! We can call it the meaty specialty. It had a very tender pork meat. The fats and umami of the meat lingers within my tongue as I chew it slowly. The juicyness of the meat made my mouth watery and made me crave more for this! I could rank its tenderness just like what I had experienced when I tasted the pork belly of Santouka Restaurant’s Miso Ramen but the texture of the meat wasn’t as awesome as what I had expected. Lets give it a 3.5 STARS! “Did ya hear that?”, I spoke. “Dope”, they answered in chorus. Apparently, this chicken was calling out for me, she was so cold that she needs to be eaten with happiness. I then started chomping to one of its parts, and viola it was the chicken breast! “Oh loving gods of chicken breast, why did you forsake me?”. The chicken was well marinated, I could taste the whole juiciness of the breast, but it wasn’t as great as it seemed to be. I would have loved it with more umami that could linger within my mouth, but it wasn’t as good as what they have told me! The umami was not very strong, the tenderness wasn’t as good as the pork and or beef! I could only taste the happiness on the surface, but in the inside? Nope. I can give this part a 2 STARS for the meal. Maybe it would have been a different story if they used (or at least I have tasted) a chicken thigh. As I move deeper into the cold hole, I saw a clear black gem! It was sparkling like a diamond. I wasn’t so sure what kind of food was it, but according to legends it is called as the “Century Egg”~~ a.k.a pidan (were the egg really from a century before?). Century egg inside the Fortune Seafood Restaurant’s Cold Cuts was to add additional flavor in the dish, but was it worth it? I tried to check out one of the sliced egg, tasted and I wasn’t really sure what to react. The taste was out of the world, I could not find any saltiness inside nor any umami that lingers within its core! I wasn’t really sure if it was tasty or not since it was my very first time eating that kind of dish, I was not really sure if it tasted “right” or “wrong”? But in my opinion, I did not like it. I can only give it a 2.5 STARS as a bonus! Let’s see what’s the overall score of the dish! From the root word “cold”, the dish was literally cold as ice! I am the type of foodie lover that enjoys meat in a hot sizzling plate. Naturally Cold cuts are served with preserved or cured meat such as luncheon meat and sausages, but their ‘cold cuts’ was entirely different from the others. I can give them a plus points on the originality of the dish as well as the meaty ingredients, but the taste and umami wasn’t enough to satisfy the lust of my tongue. 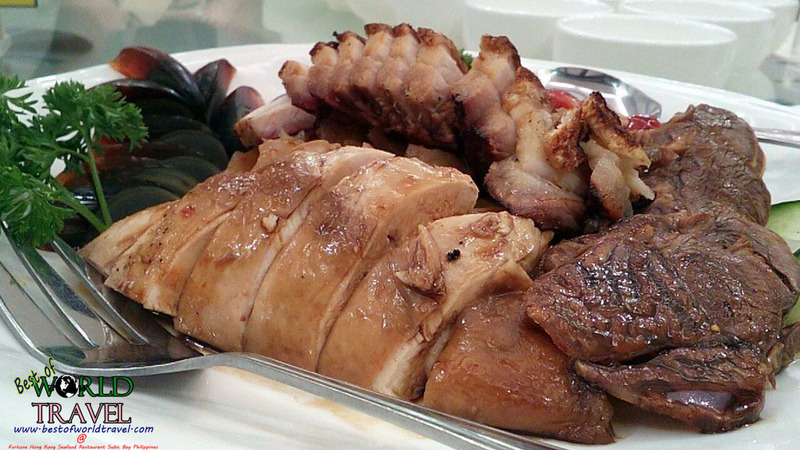 The overall rating of Fortune Hong Kong restaurant’s Combination Cold Cuts is….. 3.0 STARS! I can only give it a slightly above average rating (out of 5) since it wasn’t as great on what I had expected. Just before finishing the Combination cold cuts, there was another dish that came running into our table, the Angus Beef Cubes. At first, I thought it was some Adobo cubes, since the color somewhat resembled each other, but I was mistaken, the waiter told me that it was the Fortune Hong Kong Restaurant’s Angus Beef Cube. The taste was very plain for me, I also did not like it. I was expecting too much, but just a few bites made me felt like I got bored just eating it. I can give it 2 STARS because the flavor wasn’t as strong as what my tongue wanted. Angus Beef cubes at upper left part. The next dish was a combination of everything they placed on our table. There were huge shrimps, but it tasted normal, some quail eggs that I did not really liked because of the breading it really tasted different from what I had expected because — “hey, it’s quail eggs! I have been eating those sine I was a kiddo!”. I liked their mixed vegetables with broccoli and kangkong. It really felt like a very good Chinese dish in front of me. As well as their fish fillet with tofu and mushroom. It was a refreshing feeling after eating some foods that did not impress me too much. Their fried rice was top notch as well, it felt like a rival of a huge bowl of Chowking’s Chow Fan! Four STARS for their friend rice! After a great selection of lunch, their goes the dessert! Oh man, who doesn’t love desserts? The dessert was… a cold mango juice? 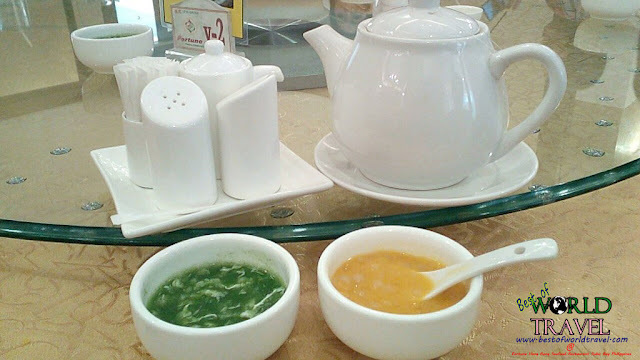 It was like a fresh mango juice that looked like a soup in a bowl with some sago. I was excited, but it failed me. I don’t know why, but the taste was not in harmony! I felt like everything was in a mess just by sipping some of those. Even so, I finished three bowls of it because everyone didn’t liked it as well (they gave me their shares) — awww, 2 STARS! The security guard was in a great suit. He seemed like a running congressman in the election. He greeted us and helped us enter the restaurant, for the first time. The waiter that assisted us got something horrible on my side, noo~~ my juice without ICE! I asked a juice without ice but then he gave me a glass full of ice! What a horrible joke to make! The same waiter weren’t also as knowledgeable about the food he was serving, he did not know what are the names of their menu. Sometimes, when I try to ask about the name and or main ingredient of the dish, he will ask his colleagues regarding this. One time, someone with different uniform talked to me regarding the menu and the dish served (maybe he was the manager). In the end, he just gave me their menu list (without photos), and left me like a newborn puppy that knows nothing on what I have been reading. Oh my, which is which? 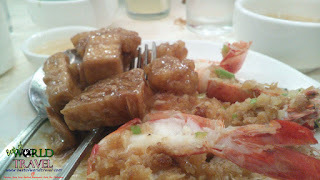 It was fun in dining at Fortune Hong Kong Seafood Restaurant Subic Bay, they had a very ambient chill in the whole place. The temperature was pretty much normal that wont make their guests shiver every time they chomp their dish. 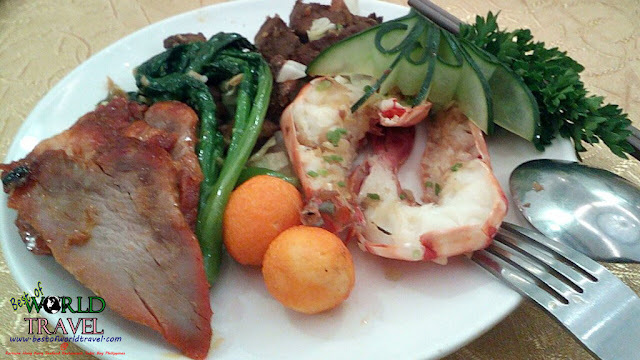 Even I had heard great things in Fortune Seafood Restaurant, there were still some dark sides that I had experienced. There were also some flies (dead on arrival) that I saw on the table, why oh why? The renovation during operation hours and some downsides of their menu. 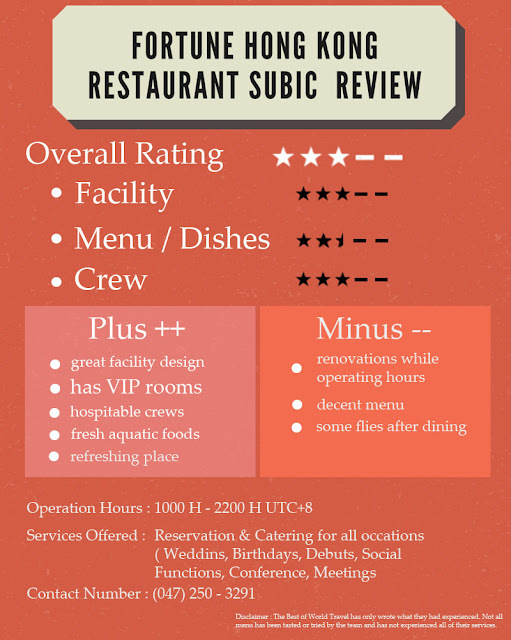 I have heard so many great news regarding the Fortune Restaurant in Subic. 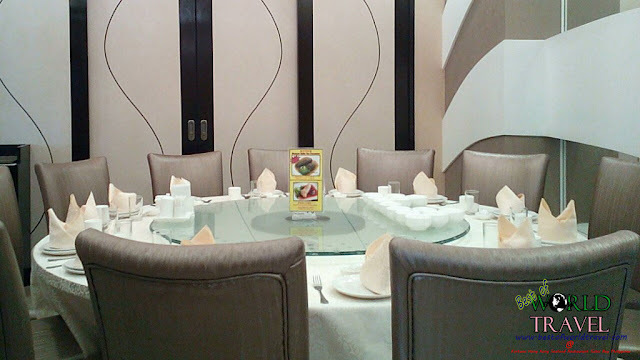 “The best Chinese style restaurant in SBMA”, but we were not able to fully experience it. Even though I was not able to like most of the dish served to us, I can still recommend Fortune Restaurant to you guys, and try their Chinese cuisine. I still had fun on their restaurant from the design up to their top notch meals. In the future, I wanted to return to this same spot just to order their MOST exquisite food that will satisfy my appetite. I know there are better dishes out there, we just could not afford to take their best shot! Fortune Hong Kong Seafood restaurant Subic Bay accepts reservation & catering for all occasions such as weddings, social functions, birthdays, conferences, debuts and meetings. You may call their hot line (047) 250-3291 for inquiries.